Home appliances like washing machines, refrigerators, irons and blenders are concerned, first and foremost, with practicality. But should we expect more? This year’s Electrolux Design Lab challenge asked international design students to come up with appliances that engage the senses in new and surprising ways, drawing inspiration from ‘experience creators’ like professional chefs and interior designers. The top 30 semi-finalists have been announced, and ten finalists will present their entries in Milan on October 25th, 2012. Here are 5 of the most intriguing entries. 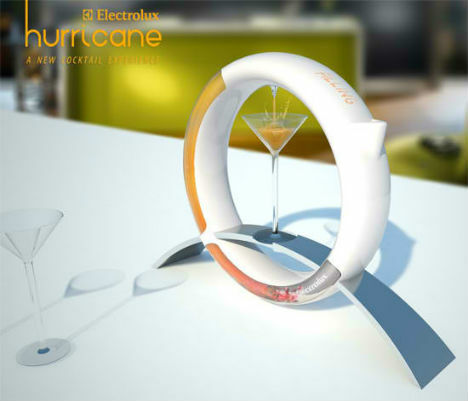 The wheel-shaped ‘Hurricane’ by Kuan-ting Ho looks like a cool addition to a space-age tablescape. But it’s much more than just decor – it’s a blender that produces the perfect mixed drink. 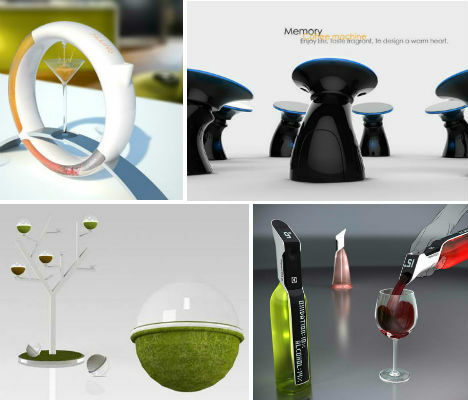 Browse a programmed library, choose your drink and a recipe will instruct you to insert certain ingredients into a spout on the top of the gadget. The mixer will do the rest. Tree + Eat = Treat. 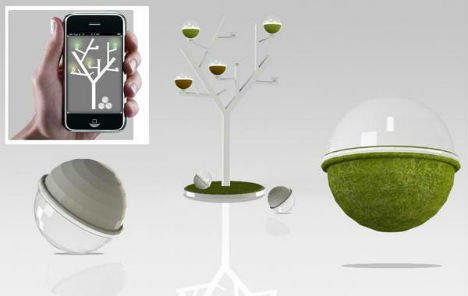 Amy Mon-Chu Lu’s ‘Treat’ is a tree-shaped device that helps you store food properly and keep track of its freshness using mobile technology. Vacuum-sealed pods serve as food containers that change color to warn you when your food is nearing its use-by date, and they’re actually dropped from the tree when they expire. Throwing on an outfit, only to find that it’s wrinkled and needs to be ironed, is the worst when you’re in a hurry to get out the door – and especially when you’re traveling and don’t have a lot of extra clothes with you. ‘Touch’ by marks Marks ensures that you look presentable at all times. It’s a portable ‘iron’ that uses infrared light rather than heat to smooth the fabric of your clothes while you’re wearing them. 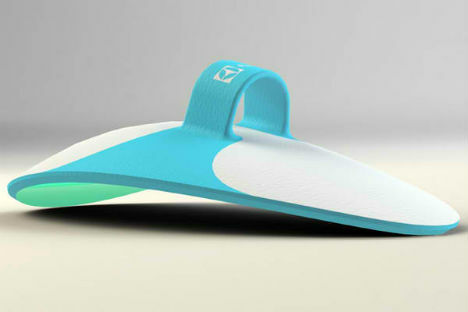 It doesn’t even need to be turned on or off – it automatically starts working when it senses the fabric. Wine connoisseurs go through a lot of trouble to be sure that the wine they’re drinking is served at precisely the right temperature, but most casual wine drinkers don’t have the time or inclination to follow suit. That doesn’t mean they can’t enjoy wine to its fullest potential. 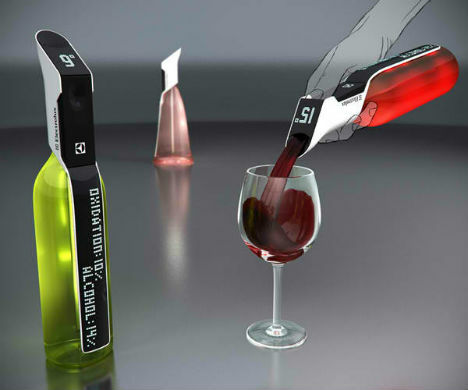 The Wine Steward by Roman Blahnyka maintains the perfect temperature for any type of wine, also creating a vacuum within the bottle to ensure that your leftover wine never goes to waste. You like your coffee balanced and fruity, while your partner prefers it dark and intense. This gadget uses your handprint to remember exactly how you like your coffee, so you don’t have to compromise. 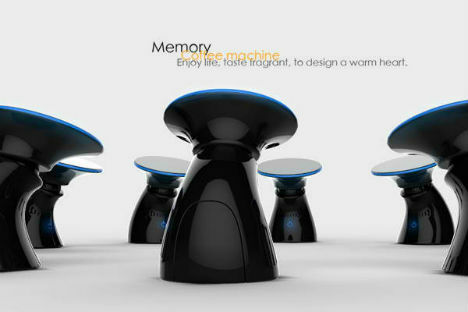 ‘Memory’ by WenYao Cai scans your hand and then serves your coffee just right – perfect for people who can barely function until they’ve had a cup.